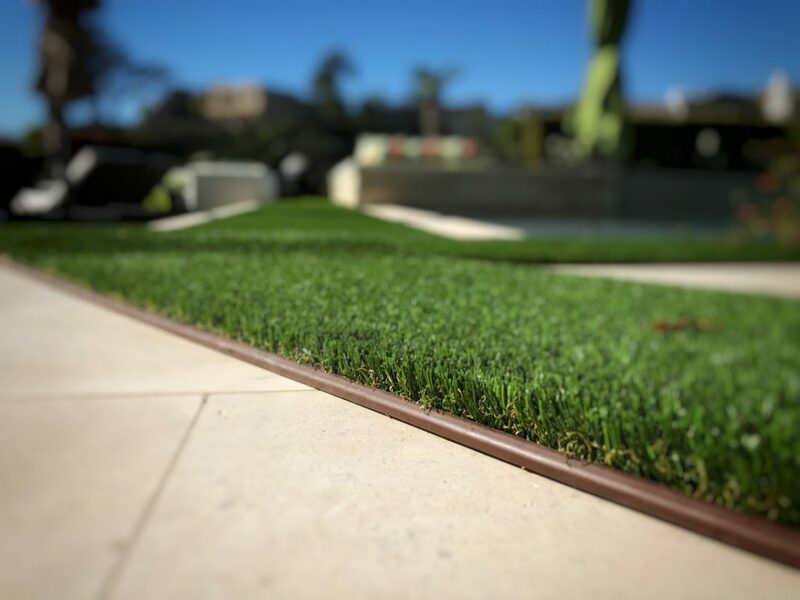 When it comes to artificial turf installation, seams and edging are what separate the pros from the bros. Keeping a close eye on the gauge width dimension of the fiber rows is crucial for seams that stay invisible without rupturing. Picking the right edging material is crucial for perfectly finished edges. While bender board was the industry standard for years, pros are turning to Wonder Edge as a superior alternative. Here’s why. The bedrock of a successful artificial turf installation is the base. Pun intended. The turf on top is only as stable as the base underneath. But all the grading, leveling, and compacting is for naught if your edging doesn’t prevent the base from eroding. Without support from the base, depressions appear. Even worse, the materials used to affix the turf can come lose. Not only is it unsightly, it is hazardous. 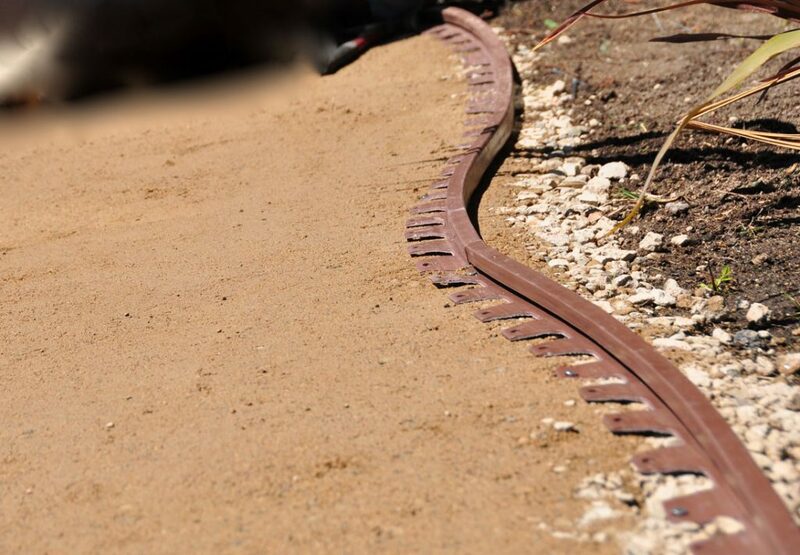 Now if you are installing next to a hardscape, the edging is not a problem. But most installations incorporate beds, pet areas, planters, and other spaces. A turf edging is essential. 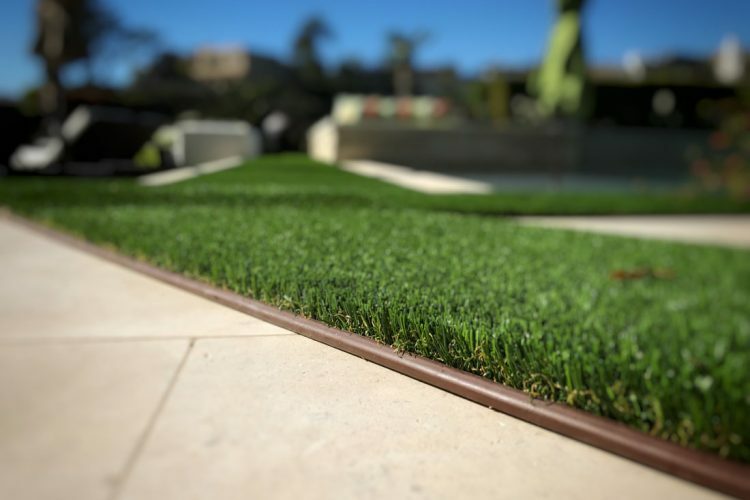 That’s because a proper turf edging installation does more than just look good, it holds the base in place to prevent erosion. It doesn’t interfere with drainage because it is not higher than the blade level. The more flexible the edging, the more flexibility in your design. Flexible turf edging accommodates the curves that are found in nature as well as less formal artificial turf designs. 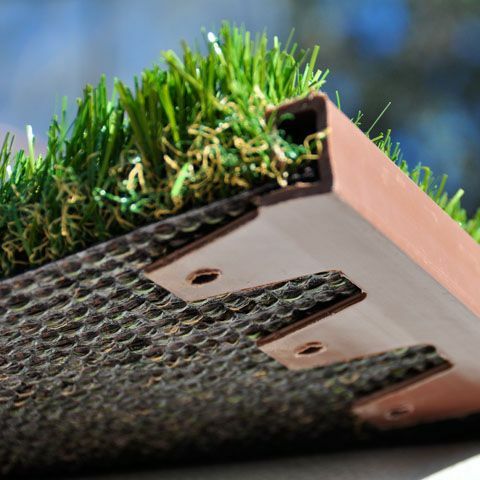 Traditionally, plastic bender board that emulates wood has been used as turf edging for synthetic turf applications. Paver edging has also played pitch hitter as a synthetic turf edge. However, plastic bender board and paver edging present their own set of problems. Paver edging isn’t supposed to be exposed to the elements. It’s installed under the pavers. So, exposure to the elements and ultraviolet light cause this product to crack over time. Bender board stands up to the elements and holds the turf and base in place, but it is time consuming to install. Between digging the trench to sink the board and adding the stakes, you add considerable labor to the job. For professionals, labor is your most expensive component. For DIY’ers the amount of time you have available for labor on your project is limited. After all, you still have to clock in at your real job. The alternative is Wonder Edge. This patented product goes down quickly, holds the base in place, and doesn’t require more than a rough cut on the edge. That’s because with Wonder Edge you simply nail your turf edging down with your turf nail spikes. There’s no digging and no trenching. Installation is a breeze because it consists of simply rough cutting your turf material and tucking it into the edging. The finished product is a clean, finished edge that doesn’t interfere with drainage and prevents base erosion. Contractors love the ease of installation and flexibility to use in almost any design. Homeowners love it because it lasts and looks neat and manicured. Time is money. Any product that speeds installation saves labor costs. Wonder Edge excels at saving time and money. Because different applications have different needs, there are three Wonder Edge products. Wonder Edge. The original Wonder Edge is perfect for sub base installation. It is flexible enough to accommodate pet areas, planters, and tree areas. It’s available in brown, black, and green so there’s an option for any color palette. Save up to 90% compared to labor required for digging, trenching, and nailing traditional bender board. Wonder Edge LP. It’s Wonder Edge, only better. More flexible for tighter radius installations. Can be glued down for concrete or asphalt installs. Is ADA compliant and is available in green, brown, and black. The lower profile makes it the perfect choice for playground barriers. Wonder Edge LP-H. If you need to install a straight edge on a hard surface, this is the product to use. Glue it down to concrete for indoor applications. It also perfect for outdoor decks and patios with straight lines. Ready for Wonder Edge to speed your installs? Watch our installation videos then click to find a dealer near you or buy Wonder Edge online.